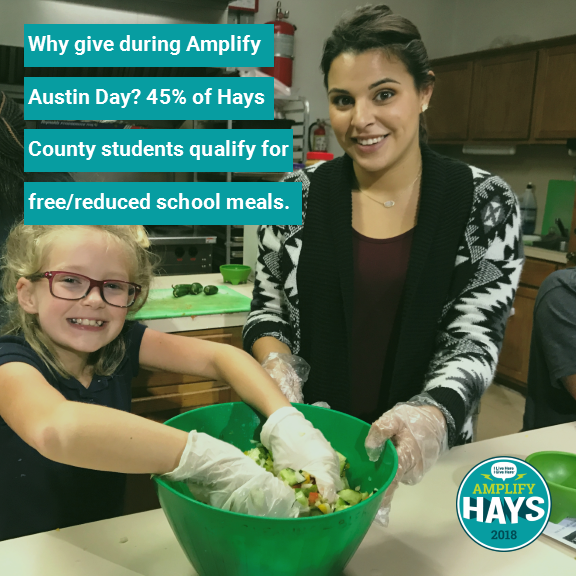 For 24 hours starting on March 1st at 6:00 p.m., we are taking part in Amplify Austin! Amplify Austin is an online fundraiser held for Central Texas charities with the idea to give back to the community you live in. While Austin may be in the title of the event, outlying areas such as Hays County are invited to the party. This event amplifies ~700 unique nonprofits in the Central Texas area and was created to increase donations for local causes through a unified 24-hour day of giving. We rely on the generosity of our community in order to keep fighting hunger daily. Every donation makes a difference, and here’s your chance to join a movement of giving. $1 can provide 4 meals, $10 can fund one nutrition education class, $15 can provide food transportation for one day, and $30 can provide 10 students with a serving of food through our backpack program. In order for us to continue providing food assistance, nutrition programs, and advocating on behalf of food insecure households in this community, we will continue to need your help. Pack a Bigger Punch During our ‘Power Hour’! 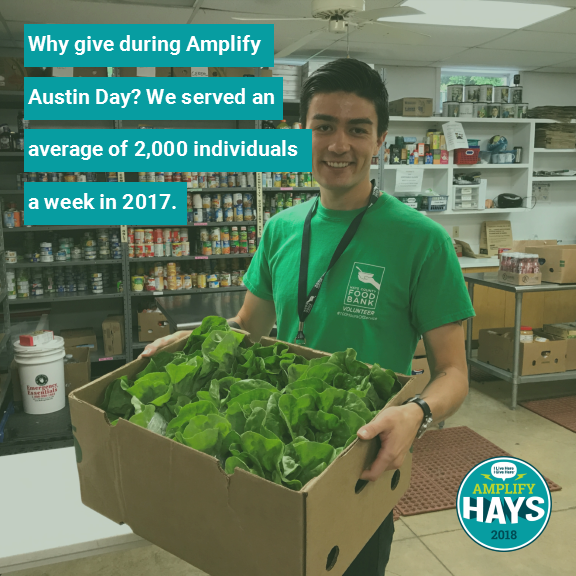 Throughout Amplify Austin Day there are opportunities for nonprofits to boost, or rather amplify, donations received. Each hour, $1,000 is awarded to the nonprofit who receives the most unique donations or the largest value of donations (depending on the hour). We invite our supporters to give between 11:00 p.m. and 12:00 a.m. on March 1st. We are looking to have the most unique donations out of all other participating small nonprofits at this time (monetary amount does not matter). 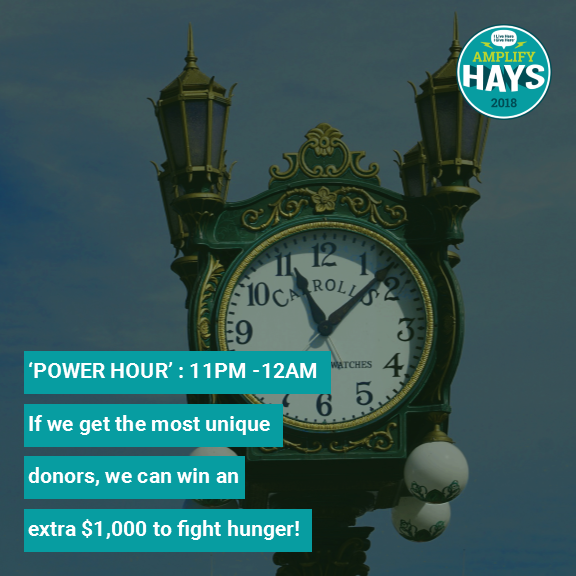 Unfortunately, scheduled donations do not count towards this ‘Power Hour,’ but all donations are much appreciated! Don’t forget to recruit friends, family, and coworkers. The more donations we receive, the better our odds of winning the hour. We are very grateful to take part in this opportunity to Amplify Austin and the Central Texas area. It is a great way to give back to your community, show support for local nonprofits, and spread awareness of worthy causes. We could never do what we do for this community without the help of every donor, volunteer, and advocate. Thank you, and we hope to see your support on March 1st!